Up-and-coming English talent Patrick Rooney (on left) secured his first ever PSA World Tour title after coming through a brutal five-game thriller with Spain’s Edmon Lopez Moller in the final of the Madeira International Squash Tournament - despite beginning the PSA M5 event unseeded. Coming just days before his 19th birthday, Rooney celebrated a series of upsets as he battled through to the final, defeating top seed Shehab Essam and number four seed Rui Soares en route, while Lopez had already beaten two Englishmen, Luke Parker and James Peach, to set up a final clash with Rooney. The opening exchanges saw a number of lengthy, attritional rallies play out in front of the crowd at the Onda Revital Club in Funchal, Portugal, with both players taking a game apiece. With the scores level, a change of tactic from Rooney saw the World No.192 attempt to take the ball short at every opportunity, but it initially appeared to have a debilitating effect as Lopez capitalised on some unforced errors from the youngster to go 2-1 ahead. A reinvigorated Rooney recovered in the fourth though to level proceedings once more, and a back and forth decider saw Lopez sustain an ankle injury after Rooney had recovered from 3-0 down to go 6-4 up. The Spaniard battled bravely on, but fatigue began to set in and Rooney took full advantage, converting his first match ball at the end of a typically gruelling rally to open his PSA World Tour title account. “It’s an unbelievable feeling and a nice early birthday present,” said Rooney, who later dedicated his victory to his aunt, who passed away last week. For Lopez, however, the wait for a first PSA World Tour crown goes on after he lost out in a second successive final, having also fallen in the same stage of the Raanana Squash Center 30th Anniversary Festival last month. “I saw a really good opportunity to win this week when Carlos [Cornes Ribadas] got knocked out in the first round," Lopez said. "I am happy to reach the final, but it’s just a shame that I was so close to victory again. I am still young, so I hope that I will get plenty more opportunities to win my first PSA title. Physical fitness is normally my biggest strength, so it’s annoying that it let me down today. 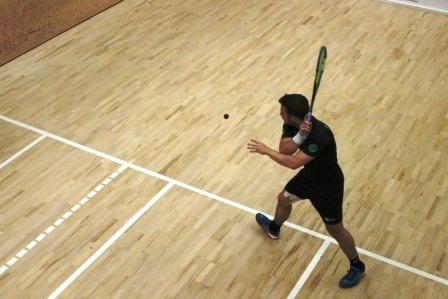 Unranked Englishman Luke Parker stunned compatriot Sam Ellis to qualify for the main draw of a PSA World Tour event for the first time in the final qualifying round of the Madeira International Squash Tournament in Caniço, Portugal. Parker, the brother of World No.74 George, also upset the odds by ousting Dutchman Tesse Jutte earlier in the previous round, and showed flashes of his younger brother’s shot-making as he battled to an 11-9, 5-11, 11-9, 11-8 victory in the PSA M5 event at the Onda Revital Club. The 21-year-old now faces English seventh seed Ben Coates for a place in the last eight, but admitted he has already exceeded his own expectations. “I didn’t really expect anything this week,” explained Parker. Commenting on his last-16 clash with Coates, Parker added: “He has got a lot more tournament experience than I have, but I remember playing him a few times when we were juniors and it was pretty close. Meanwhile, Adam Auckland continued his comeback from a near two-year injury layoff as he cruised past Welshman Owain Taylor in straight games. Auckland, who reached the semi-finals of the British U23 Open in January, barely surrendered control in a one-sided encounter and now faces Irish sixth seed Sean Conroy for a spot in the quarter finals. But while Auckland and Parker will steel the headlines, the biggest cheer of the day was reserved for Spaniard Pascal Gomez who edged past Matthew Broadberry to book a first-round matchup with top seed Shehab Essam. Gomez’s boundless energy drew plenty of gasps from the Portuguese crowd and ultimately proved the difference maker as a frustrated Broadberry fell to a three-game defeat. On the adjacent court, England’s James Peach secured a last-16 meeting with second seed Carlos Cornes Ribadas after comprehensively outclassing unranked Irishman Michael Conroy. Conroy, who was bidding to join Parker as a first-round debutant, struggled to keep pace with Peach’s intensity and fell to a 3-0 defeat in just 19 minutes. Former world No.105 Adam Auckland (right) ended a 20 month injury-enforced absence from the PSA Tour as he led a quintet of English players through to the final round of qualifying at the Madeira International Squash Tournament, PSA M5 event in Caniço, Portugal. Auckland, 23, has barely played competitively since landing his maiden title at the 2014 North Coast Open in Australia, but showed few signs of rustiness at the Onda Revital Club as he brushed aside Jorge Monteiro in straight games. “It’s been a long road to recovery,” said Auckland. “I sustained an injury to my adductor just before I went to Australia and I actually haven’t played on the PSA Tour since the Bexley Open in October 2014. “I tore my adductor for a third time in February last year and that was when I discovered the underlying problem was caused by Gilmour’s Groin. Standing between Auckland and a place in the last 16 is Welshman Owain Taylor, who lost just nine points en route to thrashing Luis Tavares of Portugal. Elsewhere, Luke Parker sprung the first major upset of the tournament as he knocked out Dutchman Tess Jutte in four games to set-up an all-English clash with Sam Ellis. Parker, who is the older brother of last year’s runner-up George, recovered from losing the opening game to record one of the biggest wins of his young career. The 21-year-old also kept alive his hopes of making the main draw of a PSA Tour event for the first time. The result completed a miserable couple of days for Dutch representatives after Roshan Bharos was forced to pull out on the eve of the tournament after misplacing his passport. The Dutch No.5’s withdrawal sees Michael Conroy, brother of Irish No.2 Sean, advance into the final round of qualifying without even hitting a ball. Conroy now faces James Peach for a place in the main draw, after the 18-year-old swept past Ricardo Santos in three games. Top qualifying seed Pascal Gomez was in a similarly ruthless mood as he marked his return to competitive action with a convincing straight-game victory. The Spanish No.10 has not played on the PSA Tour since his last-16 defeat at the Finnish Open in January, but needed just 13 minutes to advance at the expense of co-tournament organiser Ricardo Sardinha. Next up for Gomez is a meeting with Matthew Broadberry, who overcame a third game wobble to beat Alfredo Felicidade 3-0. Ellis completed a clean sweep for England after defeating local favourite Goncalo Miranda by the same scoreline.